I found myself doing the following: I had a bunch of predictors, one (numeric) outcome, and wanted to run I simple regression for each of the predictors. Having a bunch of model results, I would like to have them bundled in one data frame. So, here is one way to do it. Say, mpg is our outcome/ criterion. The rest of the variables are predictors. For illustration, let’s run a regression with each and all of the predictors as a preliminary step. Of interest, no p-value is below .05. Now come the main part, let’s run multiple regression and then combine the results. l4: now get the summary of each lm. More specifically, we have a number of lm models, which are stored as list elements. Now we apply the summary function to each of those list elements (lm results). l9: filter those lines, where predictor is not equal to “(Intercept)”. Now, for completeness, let’s look at the $R^2$. 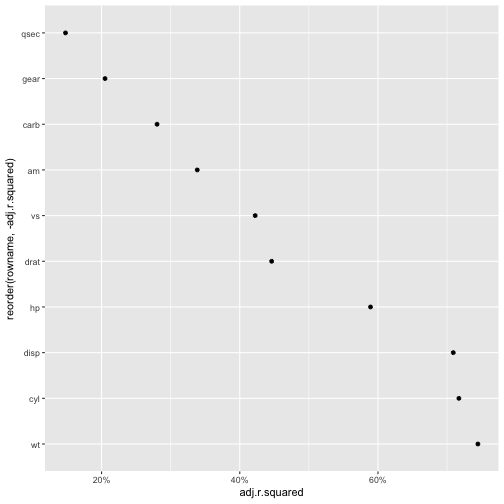 Ok, I admit, I like plotting, particularly with ggplot2. 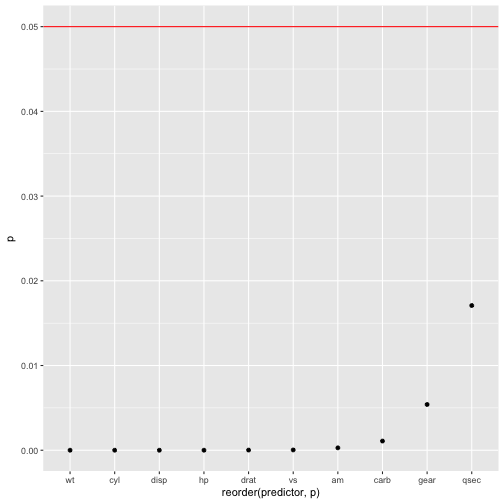 Last, the p-values of each predictor (OMG).